I have recently “come out of the closet,” so to speak, that after 5 years of wavering I cannot accept the notion that Jorge Bergoglio is or ever has been the Vicar of Christ. Many people have attempted to provide “plans” or “predictions” for worldly processes of “purifying” the Catholic Church–but that is only going to happen with direct, obvious intervention by God, whether it’s in the form of the actual Second Coming or the time period variously called the “new Pentecost,” the “Triumph of the Immaculate Heart,” “Eucharistic Reign of Christ,” etc. As I have also been very open about sharing, I’ve been deeply shaken to my core not just by recent news headlines, which really aren’t that surprising to me except the depth to which we have been lied to by the hierarchy, but by personal events. I was diagnosed with epilepsy, and since that diagnosis have read some very convincing arguments that most of the Bible and most of the apparitions and miracles that have given me confidence in Christ may have just been epileptic seizures. And they make a good case. And every “But what about–” I think about comes from the Church, which has been lying to us about all sorts of basic things. On the one hand, much of what sedevacantists see as heresy in the Vatican II era is really based on their own Jansenism and/or the Tridentine and Vatican I rejection of all but a few specific theological traditions and emphasis on Papal supremacy. In spite of their own arguments for Jansenism, the sedes seem to hold that if they are wrong about the Papacy being vacant or the Mass being invalid, we’re saved by faith, so doing what they think is faithful to the True Church, even if they’re wrong, is better in their view than attending the Novus Ordo. They do not seem to give the same benefit of the doubt to those who go to the so-called “Vatican II sect” in good conscience. Do not spend too much time trying to figure things out — it can lead to pride, vain curiosity, dangerous ideas, and a misplaced reliance on self rather than on God. In general, we are well-advised to seek after virtue rather than knowledge. Certainly we may suppose that living a holy prayerful life and seeking to be pleasing to God, cannot but hasten the day of Restoration. So, if I should be relying totally on God, then shouldn’t I just do the basics in the most practical way possible? Is God a Cosmic Sadist? Answer: People choose Hell over God. Question: “How could a Christian make that choice? Answer: By formulating and clinging to a false notion of God that makes us recoil when we see the reality, or by allowing ourselves to be so attached to sin that we don’t want to be relieved of the attachment even in Purgatory. Answer: That’s a mystery. The Old Testament basically says that’s what God is, at least from our perspective, and we just have to accept it because He’s God and we’re not. New Testament atonement theology doesn’t help much, and there are many interpretations that try to get us out of that trap. The simple answer is love, and the personalism of St. John Paul II. Yes, God could have made us differently than He did. He could have made the angels differently than He did. Maybe He has made other life-forms that are different–He certainly seems to love diversity and possibility. But the fact is, He made us, and He made us such that, just as each specific kind of plant or animal needs certain nutrients and environmental factors to thrive, so people function to our fullest potential when we live according to God’s design and intention for us. The New Testament tells us over and over that God has “imprisoned all in disobedience” that He might show Mercy to all, that He prizes the sheep who stray and come back more highly, and so on. Again, it might seem like a weird way to set things up, but the more we understand it as a relationship of love, the more sense it makes. To be free to love we must be free to reject, and I believe strongly that Christ gives us the freedom to reject Him. I believe that we have to pray to Christ to shape our understanding and our will to accept Him, just as spouses must both try themselves and pray for the grace to improve ourselves to be better people and to love our spouses for who they are, not who they want them to be. I believe we set ourselves up for rejecting Christ when we form images of Him that conflict with Who He really is and refuse to allow those images to grow. In marriage, we start off with an idealized Other whom we love. As we grow, we realize the Other doesn’t always match that Ideal. The Ideal gives way to the Real, we try to make ourselves more like the Other’s Ideal, and one day hope that we will be together, perfected, in Heaven, where the truly Ideal and the truly Real meet. The same is true of our relationships with Christ, but the difference is that He is unchanging. We are mutable and weak, and blessed with the gifts of ignorance and unknowing that He gave us to give us the opportunity to grow. However, we start with an “ideal” of Christ that we tend to cling to. If we take our mistaken view of Christ, whatever its basis, without trying to grow in our understanding, we end up like Javert, confronted with the reality of Christ and too proud to admit we were wrong. In this sense, the ancient Christian tradition, reflected in both Catholic and Orthodox sources, tells us that it might sometimes be easier for a pagan or an atheist who has gone through life with an attitude of sincerely seeking God, to embrace Jesus when she meets Him than for a self-proclaimed Christian who is too self-confident to admit being wrong. This is also why we must caution ourselves against the extreme of presumption–we use the rather extreme example of someone who has lived a life of erstwhile holiness potentially “snapping” and committing a murder-suicide, but the far more realistic example is that we are too attached to *something* to let it go for Christ when called to do so. Paradoxically, one of those attachments can itself be scrupulosity. We can often be the worst Javert’s to ourselves–indeed, in the book, Javert resigns his position, writes a confession, and commits suicide because he has broken the Law by not arresting Valjean on sight. He cannot forgive himself for being forgiving–the ultimate paradox of the damned. The possibility of damnation does not make God a Cosmic Sadist–though, as C. S. Lewis, St. Francis de Sales and the Book of Job all tell us, even if God *is* a Cosmic Sadist, we don’t have any choice in the matter so we might as well play by His rules. At judgement, we put God in the Dock, as Lewis says–we judge Him. We say, “I can’t accept Your Mercy,” or “I can’t accept Your Justice,” or both. In Lewis’s Great Divorce, souls are first tempted — not with the more obvious ones but tests of pride, impatience, etc.–and then greeted by Saints they have the biggest grudges against. This is similar to the Orthodox theory of the “toll booths”—that personal judgement is a journey, where we must stop and confront different temptations that plagued us in life, and if we don’t built up the resistance to them now, we won’t be able to resist them then. As well as the tollbooths, like in Lewis’s story, the soul is called to both by the Damned and the Saved, and if the soul has kept bad company in this life, she will be drawn to the appeal of the Damned to join them. The other mistake we can make with every conception of judgement, even the “tollbooths,” is that we think, “Christ forgives everyone. He will forgive me.” We presume that we haven’t bought into Satan’s sales pitch. We presume we will be able to withstand any temptation in our final journey or that we won’t find ourselves agreeing with all the celebrities and internet combox atheists who say that they’d rather be in Hell because all the interesting people are there. We have to shape our minds, our lives, our desires to make God, as He has revealed Himself to be, desirable to us, and to recognize when the World is trying to make us think differently of Him. Grace is received according to the mode of the receiver. Some people naturally love vegetables. Most people don’t. Most people love a few particular vegetables. For me, my favorites are broccoli and spinach, which I’d eat an entire package of on my own if I could but I take Coumadin so I’m only allowed to eat small amounts of them. Ironically, a few months ago I ate a whole bag of broccoli by myself and sent myself to the ER with a clot. If we don’t have any desire to eat vegetables, we need to have our desires adjusted before we can eat them. If we grow up eating vegetables, it is easier to love them as an adult. Often, if we grow up eating both, or having our vegetables coated in twinkies, as someone recently suggested, then we are really being taught that vegetables are not desirable. If we have a desire to eat vegetables but a greater desire to eat junk food, we might eat *some* vegetables but not all the vegetables that are being served to us because we spoiled our dinner by filling up on junk food. If we fill up completely on junk food, we have no room for vegetables. So it is with grace. Our Father in Heaven is offering us a smorgasbord of spiritual vegetables. Our Lady of Victory told St. Catherine Laboure that the precious stones falling from her hands on the Miraculous Medal–the stones which Mel Gibson symbolically has her casting to the earth in The Passion of the Christ, are the graces that go to waste because people aren’t willing to receive them. Original sin and concupiscence are such that most of us are disinclined to accept His Grace. Some people are born more naturally receptive to grace. Some people are born with an inclination to particular graces from God, rather than having a well-balanced spiritual diet, gorge themselves on one kind of grace to the detriment of their overall spiritual life (such as a preference for Scripture or a particular devotion, a scrupulous devotion to COnfession, fasting excessively, doing charitable works without prayer, etc.). Some people are raised in holy homes and taught to shun the world. Some people are raised by holy parents who try to teach them the right way, but the enemy sows his seeds of spiritual junk food anyway, and the parents themselves don’t realize the subtle ways they’re teaching that God is second in their lives or that faith is not desirable in itself. Most people don’t even try to accept God’s grace, and if they try, they get their souls so full of sin that they can’t, and they need to get that out of their systems, one way or the other, before they can take in the graces God is trying to offer them. After a few discussions in the past 24 hours, I am revisiting the Socratic questions that always seem to stymie our separated brethren. Preface: St. Paul tells us to hold fast to all the Apostle’s teachings, whether by “letter” or “word of mouth” (2 Thess 2:15). Our Lord speaks of the Church having the power to Loose and Bind (Matthew 16:18-19) and frequently speaks of giving us a Church but never speaks of Scriptures as anything other than the Hebrew Scriptures. St. John tells us Jesus said and did many other things that are not recorded in the Bible (21:25). St Peter says that nothing in Scripture is personal interpretation but is to be guided by the Church (2 Peter 1:18-21). 1) So where, in Scripture, is Sola Scriptura? The usual response is some verse about how important Scripture is, but never one that proves it is *exclusive*. 3) If one truly believes in “sola Scriptura,” why quote any books or ministers? Is it not really just picking and choosing the Tradition one prefers and calling it Scriptural? 4) Last, but not least, if you are opposed to “secular knowledge,” “images,” etc., what are you doing on the Internet? A Feminist Weights in on The Annual “Mary Did You Know” Debate. 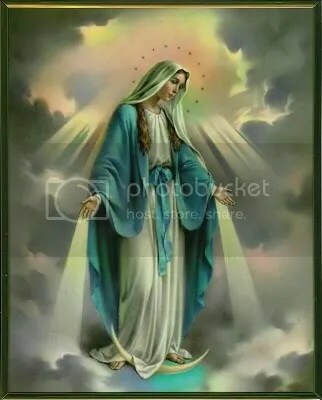 From day one [Mark Lowry] was taught that women in the bible are evil, maybe Mary was an exception to the evil, I mean she and her “purity” is what all woman should subscribe to. More likely, as a Liberty University grad fundamentalist, Lowry was taught that Mary was the most sinful woman in history. We’ve missed the fact that the news that Mary gets through this angel is that her body is about to be violated, she will become pregnant without her consent. She is to carry the child and she is to name him Jesus. She has no choice over her body or even his name. Uhh, no. She is one of only four human persons in history who ever made a truly free choice. Adam and Eve were “immaculately conceived,” so to speak. They were created without sin. Faced with the cosmos-shattering decision of following God or themselves, they chose themselves. They committed the Original Sin that each of us has had since conception (Psalm 51:5). In Catholic teaching, there are four kinds of “real Presence” of Jesus Christ. The first is “wherever two or three are gathered in My Name” (Matthew 18:20). The second is in the Sacred Scripture, the Word of God. The third is in icons or crucifixes. The highest, though, is His Presence–Body, Blood, Soul and Divinity–in the Eucharist. In the Israelite tradition, the Ark of the Covenant was the Presence of God in a similar way, containing in itself the Law (Scripture), the staff of Aaron (foreshadowing the Cross) and manna (foreshadowing the Eucharist). Anyone who touched the Ark with any sin on his conscience, Scripture tells us, would die. Gabriel said Mary was “full of grace.” How can anyone with sin be “full of grace”? How can anyone with sin truly be “at enmity” with the Devil, as God describes in Gen 3:15? If a creature with sin cannot touch the Ark of the Covenant, how could a creature with sin bear in her very body God Incarnate? Here is Mary, greeted by Gabriel, with the message that she’s been chosen by God to be the mother of the Messiah. She knows the Scriptures. She knows what it will entail. She knows she will be potentially accused of adultery and stoned. Eve had no sin, yet faced with obeying God or potentially dying from self-service, she chose death. How would we expect Mary to have chosen the hard way of obeying God, when she knew it might mean death, unless Mary *at least* had the same grace that Eve did to start out with? I *am* guilty of this Man’s Blood. “If you were blind, you would have no sin; but now you are saying, ‘We see,’ so your sin remains” (Jn 9:41). “Those who are well do not need a physician, but the sick do” (Matthew 9:12). “I am innocent of this man’s blood” (Matthew 27:24). “Blood that but one drop of/ has the worth to win/all the world forgiveness/of its world of sin” (Gerard Manley Hopkins, after St Thomas Aquinas). It is a great disgrace that one of the most important verses in the Passion narrative has been distorted into a statement of hate such that to even quote it is considered hate speech. Unless we accept Christ’s self-offering, we have no place in His kingdom (Jn 13:8). Pilate, by professing his innocence, proclaims his own guilt. The people, by accepting the guilt for Christ’s death, and accepting His blood, are actually accepting their own redemption. When the people say “Let us blood be upon us and upon our children,” that means all of us. Unless we accept our guilt for Christ’s death, and not only accept His blood offered for our sins upon us but into us through the Sacrament, we can have no life in us (Jn 6:53). This is something to consider when public figures profess their alleged Christianity by saying they have never told God they were sorry. On Saturday night, we went to a “Healing Service,” the third time I went to what I’d call a “Charismatic” healing service, with a fellow named Damian Stayne, and the first with a laymen and no sacramental aspect. I went because, though I accept my just suffering and try not to test God or seek out consolations, I so desperately want to sing again. I made the usual promise to seek the diaconate if God granted me my voice back, or for greater healing for Mary and me so we could bear another child. Of course, nothing dramatic happened. There were some apparent healings that took place–I saw many leaving very downcast, though. I was deeply troubled–not by God. I understand how God works. I was troubled by the event. The fellow was deeply admired and recommended by people I admire. I was invited the last time he came through Augusta, and I declined. What bothers me about Charismatic spirituality besides the consolation hunting that goes against the recommendations of the Carmelite Doctors–yet I also know some amazing Carmelites who are also Charismatics–is that they never make room for the importance of suffering, or the fact that God answers prayers in His own time. One thing that really impressed me was how Mr. Stayne pointed out that the man Sts. Peter and John heal in Acts (the chronologically last mention of the Beloved Disciple in Acts) has been laying outside the temple *his whole life*, and Jesus passed him by. At the same time as insisting that God has this “big bowl of healing” or some such and that He doesn’t pick and choose whom to heal, Stayne touched on the most important point. Little Therese says that one of the reasons Jesus says “faith the size of a mustard seed” is that He works miracles to nourish small faith–people with no faith will ignore miracles (“your doctor was an idiot and read the test wrong,” “we mixed up the records,” etc.) For a person with a seed of faith, a miracle will water it. But for a person with a lot of faith, God tests them. She points out that Our Lord allows one of His best friends to die so He can work a greater miracle because He is testing the faith of Sts. Mary and Martha, and showing everyone else God’s glory. Of course, a few years later, she was healed of needing her braces. Then a couple years after that she had a massive stroke. To someone with a fully formed understanding of suffering, and God’s purpose in showing His glory through miracles, Mother Angelica is a perfect example. I wish a “healing service” would include those insights, so that people aren’t left with their faith devastated by empty promises. It is wonderful when people are healded, and I believe Mr. Stayne is sincere and filling a role God has made for him. He said sometimes people come out of his services and something good happens days later. Maybe tomorrow morning will be that morning I’ve prayed for for as long as I can remember that I wake up and don’t need my glasses. However, in the meantime, I accept God’s will. I felt sorry for people who left seeming discouraged. I feel sorry for the fellow who prayed for me–he was really desperate to get me “total healing.” He was worried about *my* faith, and I tried to say how God has worked many healings in my life. So, we were concerned about our kids’ reactions to the whole thing, and we were talking to them, and our son said, with a big smile, “He cured my asthma!” We were more concerned about the “big things,” and here he was joyful that, when he got bored with the 3+ hour service, and went running around in the front hall of the convention center, he could run without gasping for air. Those are the little miracles that we need to see.